It’s not easy to find these books. Small, very small, independent press books each of them clearly a labor of love at every step of the way. I found The Cupboard Press at a writer’s and writing conference in Los Angeles last year, two young people sitting at a table in the vast exhibition hall. I liked their little books, each small enough to fit into the palm of my hand, just about, the length of a novella whether it really is a novella or a small collection of stories or a slightly experimental long form poem. My subscription gets me four books a year, one per quarter. 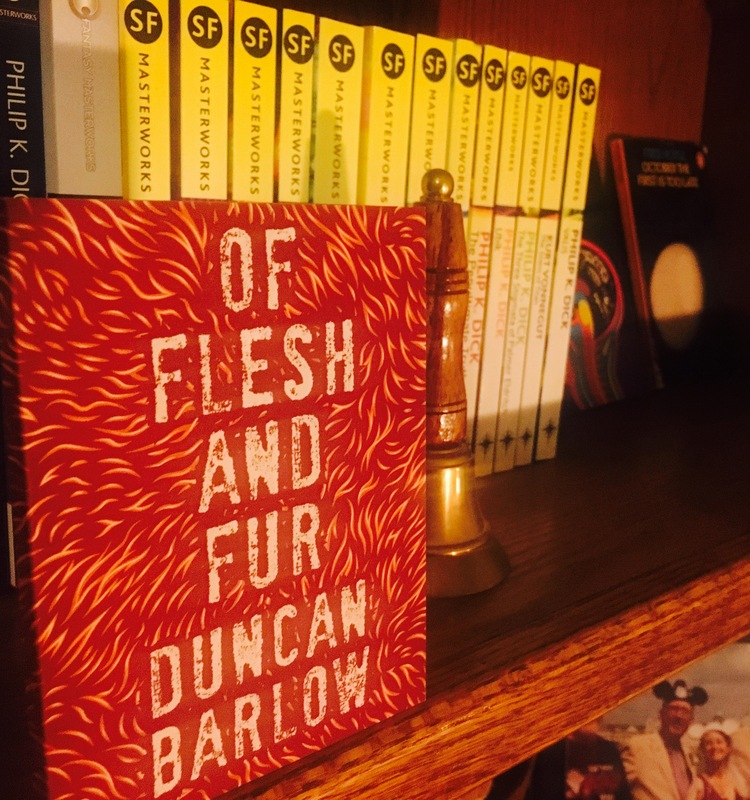 Duncan Barlow’s novella Of Flesh and Fur is the third one I’ve received. What happens after a pack of coyotes has been spotted near a Southern California suburb? A man, recently divorced decides he wants to have a child. There are women who want his sperm, but none who want him to be involved with the resulting baby. He turns to cloning. Soon he has a baby boy. Though he loves his son, clones frequently do not turn out the way their “parents” had hoped for. This child is fine for a while, kind of wonderful really, until the coyotes appear. Then the boy begins incessantly crying. Day and night, non-stop. Finally his “father” is forced to take drastic action. I thought it was terrific. An entertaining story that had me thinking. I look forward to the arrival of the next edition. You can order a copy of Of Flesh and Fur or subscribe here. I’ve no idea how they promote and sell. Some, like Meville House, are becoming fairly well known. These are “labors of love” that I’m grateful to have around.